Roger Federer was excited to pull out his SABR return to liven up a straightforward third-round victory over Jan-Lennard Struff. The defending champion needed only an hour and 34 minutes to win 6-3 7-5 6-2, extending his run of consecutive sets won at Wimbledon to 29 and making him the most successful male player on the surface. Federer's 175th win from 200 matches played sees him overtake Jimmy Connors. He unveiled his half-volley return, dubbed the Sneak Attack By Roger, in 2015 but has not used it recently. In control at 3-1 in the third set against Struff, he pulled it out again, winning the point with a follow-up volley. The top seed said: "I can never practise it because how do you? I just feel like it's not really what you do in a practice with other guys. They would be like, 'Really?' I can only really practise it with my coach. That's why it disappeared a little bit. "When I do it again, it's quite exciting for me. I always have to check the score first. I'm happy I did it. I'm happy it worked. After that I feel like there is a buzz for me. I think it just helps with keeping it exciting. I always look for new ways to win the point." Federer did not face a single break point and lost just three points on his first serve, with the only real moments of frustration coming as he pushed for a break in the second set, which eventually came in the 11th game. He said: "It's good that I faced different types of opponents I think in this first week and was able to find a way to get through. "I think it's always helpful. He is a hard hitter. In the next round it will be a lefty. "It will be much more of a strategic match." 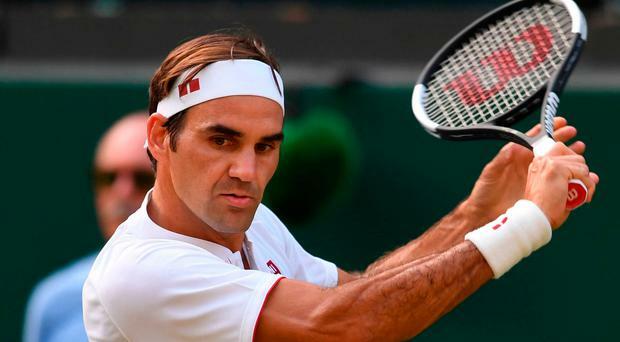 Federer is the only semi-finalist from last year left in either of the singles draws and he moves through to a fourth-round meeting with France's Adrian Mannarino on Monday. The first week has been dominated by the number of upsets, particularly in the women's draw, but Federer sees his big rivals still looming. He said: "Novak Djokovic and Rafa Nadal, all these guys are still in the draw. At the end of the day I feel on our side not that much has happened. I know on the women's side more so. "In the past it has made me nervous when I've seen bigger guys go out. I feel like, 'OK, it's me next time'. I didn't feel the effect this time." Meanwhile, Great Britain's Cameron Norrie and Jay Clarke lost a five-hour marathon that spanned three days in the men's doubles at Wimbledon. The duo, both first-round casualties in the singles, paired up to face Marcelo Arevalo and Hans Podlipnik-Castillo, and got under way on Wednesday on Court 14. Rain swiftly brought an end to their action on the first day, but Thursday allowed them to return to the court and play until nightfall. Still the match was not finished and it went all the way to a decider that had a passionate crowd on the tiny Court 14 enthralled yesterday. On the set went, lasting a remarkable two hours and 23 minutes, with Norrie and Clarke agonisingly edged out 6-4 6-7 (5/7) 5-7 6-4 22-20. Podlipnik-Castillo put away the match-winning volley and fell flat on his back before embracing his partner and commiserating with the beaten British pair. The five hours and two minutes marathon goes down as the fourth longest doubles match in Wimbledon history, with the record still held by Mark Knowles and Daniel Nestor, who took six hours and nine minutes to win a 2006 quarter-final against Simon Aspelin and Todd Perry. Amateur James Cahill has dumped Ronnie O'Sullivan out of the Snooker World Championships in one of the biggest ever Crucible shocks.